I am writing the review of Cancun – Mexico Underwater Museum (MUSA) in between of Isla Mujeres and Cancun as a certified scuba diver with logged dives in several countries under various types of diving including wreck dives. The reason to scuba dive in the MUSA because of my curiosity after all the fuss of how good it was as reviewed online and travel magazines. I like the idea of having the underwater museum to raise awareness about the important life of our seas. 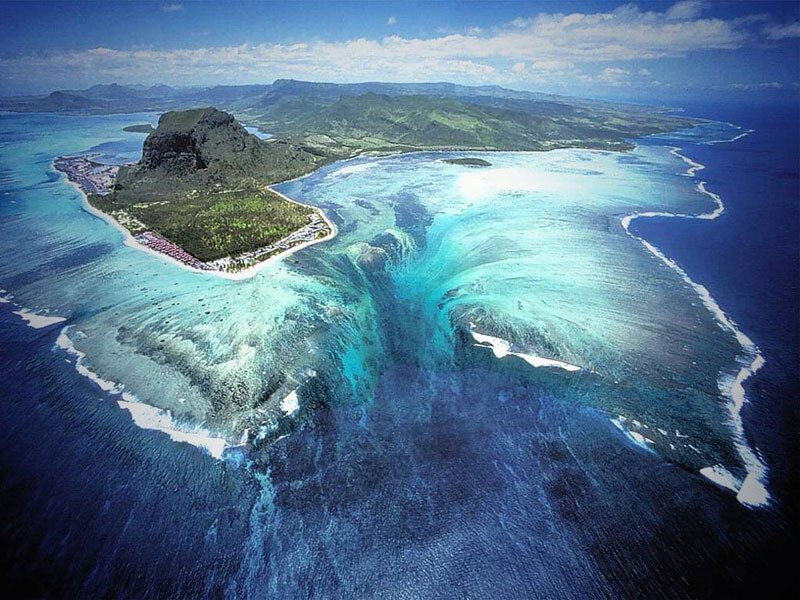 However, my diving experience in the MUSA did not meet my expectation. Maybe I had high expectation after reading reviews that called it as an amazing experience. The facts were far from amazing. My apology for being harsh, it was not a cheap diving package, and I would like to share my view here to give a balanced review about the place and the reality to expect when you took a scuba diving/snorkeling package to this museum. First, we only saw few art exhibitions – I am not sure if that was just a missed opportunity from our dive guide/instructor who was busy guarding a discovery* scuba diver at the same time as he guided us, or some collection have gone by time. A positive note here, our dive guide/instructor was friendly, and he briefed us in crystal clear instruction. He also allowed us to dive five minutes longer than usual due to our diving experience. Second, it was shallow diving – 8 to 10 meter. It was good for snorkelers, discovery* scuba and newly certified scuba divers to explore this place. But it was not as exciting as I hoped. Third, there was not much sea life in the area to see except the statues or as they called as the exhibited arts. The surrounding was mostly sandy bottom with few greenish corals and seaweed. 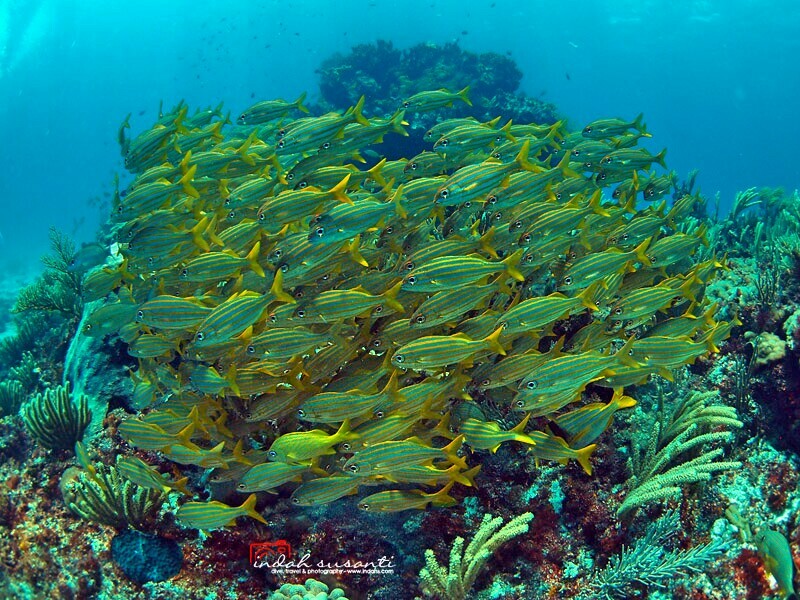 Yes, there was reef with colorful fish, but there were very few. It looked like the sea was overfished. It was, in fact: worrying. I don’t think by having the statue under the water will help the marine life to grow. Other environmental friendly actions are necessary to be taken. Fourth, it was 45 minutes bottom time for scuba divers regardless how much air has left in your tank. We were allowed additional five minutes bottom time, but that was because of our diving experience. Fifth, snorkelers joined in the same boat with scuba divers. I noticed scuba divers have more time under the water compared to the snorkelers. If you were snorkeling on the boat with scuba divers, be aware of the possibility to wait on the boat for the scuba divers. I don’t think I will visit it again even if I am staying at the Cancun’s hotel zone for the second time (which is most likely could happen) unless there are new and super special arts displayed in the MUSA. 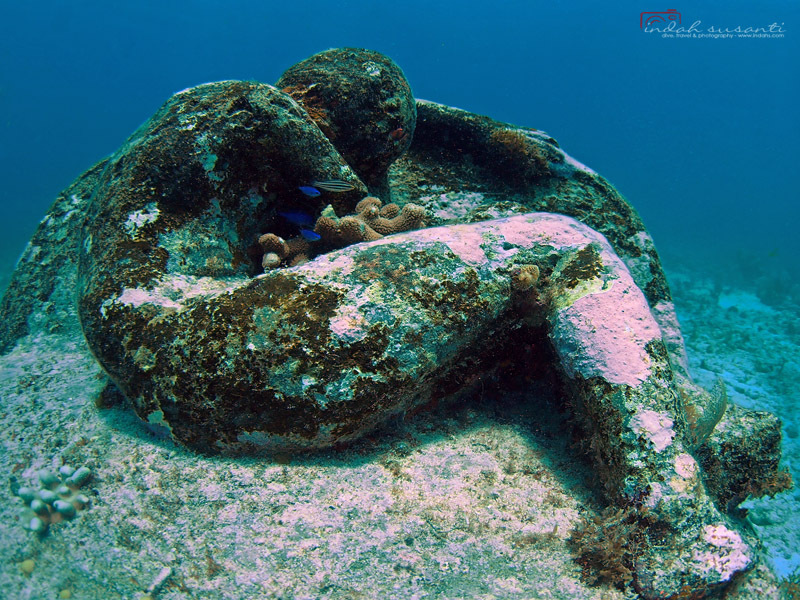 For snorkelers, just be aware that the depth was between eight to ten meter, you might have to do free-diving to see the statue. If you join Discovery* Scuba or newly certified Open Water scuba diver, this place is good to practice and enhance your skills while enjoying the arts – the seawater is mostly calm with good visibility. *Discovery Scuba is a scuba dive package for a person without prior scuba diving experience nor a non-certified scuba diver. Usually, a discovery scuba diver is allowed to dive under full guardian of a scuba diving instructor and not to scuba dive for more than 10 meters deep. Good to know your experience Indah. your photos , as usual, are stunning! From the photos one would think it was excellent. Thanks for the info that says otherwise! That had to have been disappointing. Sadly the sea looks really miserable there, they have to do more than just putting sculptures and getting money from tourists.. Thanks for sharing and being honest about it. Sometimes people are taken in with the novelty value about a place as cool as this and don’t give the complete picture. Looks great and I think if I was there I would like to do it once just so I can boast about it a little.